Mary Lee Kerr's clay piece "Resist," which was part of the 2017 exhibit, depicts a diversity of fists raised in protest. Mary Lee Kerr's "Our History," a work in clay, will be part of the Artists Take a Stand 2 exhibit. The piece addresses the issue of race in America. Mary Lee Kerr says she was hooked on sculpture the first time she tried it. Kerr was an exhibitor and organizer of the first Artists Take a Stand exhibition of the Art Alliance of Central Pennsylvania in 2017. She’ll be an exhibitor again this year. The Artists Take a Stand 2 exhibition opens Friday, February 1, from 5-8 p.m. at the Art Alliance Gallery Downtown as part of First Friday in State College. The exhibition continues through Sunday, February 24, with gallery hours Thursdays, Fridays and Saturdays, noon-6 p.m. and Sundays noon-4 p.m. The Art Alliance, a 50-year-old community arts organization, has been Kerr’s artistic home for 16 years. She has served on the board, taught sculpture classes, taken classes, and participated in and organized art shows. “Mary Lee was the chair of our first Artists Take a Stand exhibition and feels strongly about many of the current concerns about our country,” says Marie Doll, executive director of the Art Alliance of Central PA. The first Artists Take a Stand exhibition took place the March after the 2016 presidential election. The artists Kerr spoke to at the time had very strong feelings about the election and were looking for a way to express themselves. For the exhibition, artists are encouraged to make art about the current issues that concern them the most, including electoral politics, racism, the environment, women’s issues, economics, education, foreign relations, and more. “While I’m not an organizer this time, I think this year’s show will be similar in that artists have strong feelings about what’s going on politically right now and welcome an opportunity to make a statement through their work,” Kerr says. For the first show, Kerr created a piece called Resist. When she went to the Women’s March in Washington, D.C., in January 2017, she saw a diversity of people protesting. 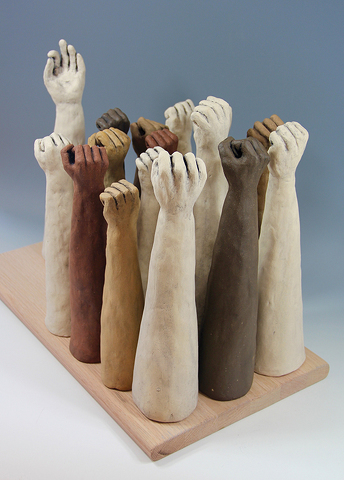 The piece, done in different colors of clay, depicts a diversity of fists raised in protest. This year, Kerr is entering a piece titled Our History, which addresses the issue of race in America. 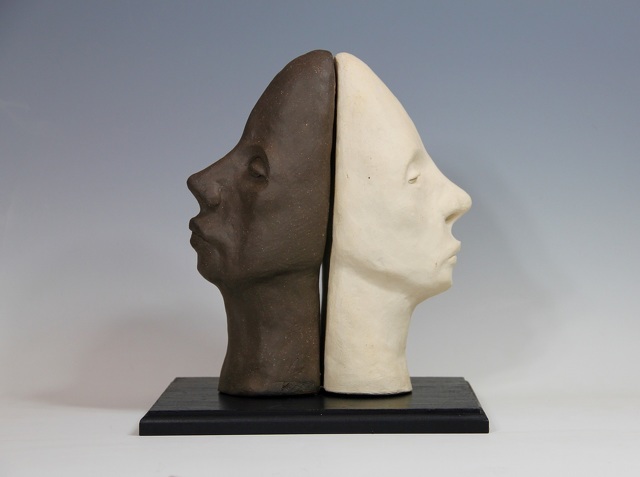 Also in clay, two portrait heads – one black and one white – are placed back to back, facing in opposite directions. The first Artists Take a Stand exhibition created a lot of dialogue about current issues, and Kerr hopes this year’s show will accomplish that and more. Kerr has exhibited her work in galleries and art shows in North Carolina, Pennsylvania, and Australia. She has also shown work and won awards in Art of the State, a statewide juried art exhibit at the State Museum in Harrisburg. As a mother of young children, Kerr did sculptures divided in parts titled Zerrissenheit, meaning “pulled-to-pieces-hood” in German, about women juggling partners, children, work, parents, friendships and their own needs. See more of Kerr’s work on her website, kerrsculpture.com. For more on the Art Alliance, visit artallianceofcentralpa.org.